Duke's mayonnaise is celebrating 100 years in business by selling limited edition glass jars of its mayonnaise — as opposed to those plastic jars all condiments come in nowadays. Duke's has rather passionate followers. It's some kind of Southern thing. Southerners LOVE their mayonnaise, especially mayonnaise and tomato sandwiches. 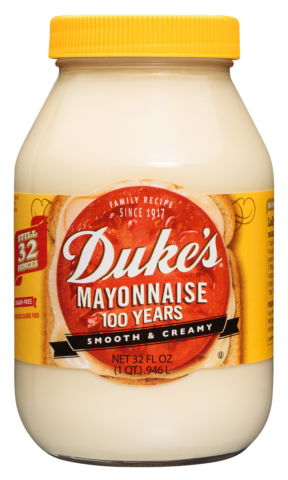 And Duke's is held in high regard as being the premier Southern mayonnaise. I've had it, and I agree it's pretty good. It's not a sweet mayonnaise. In fact, it has no sugar in it at all. It's like Hellmanns, but a bit tangier. Anyway, some people love the stuff so much that they've arranged for their ashes to be stored in a Duke's jar after their death. So if you order the limited-edition jar, that's one thing to do with it once you've eaten the mayo. 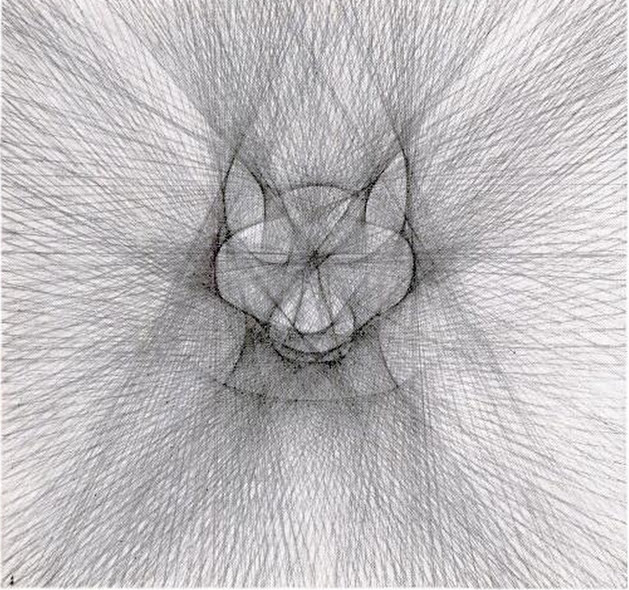 What is the secret technique behind this drawing? 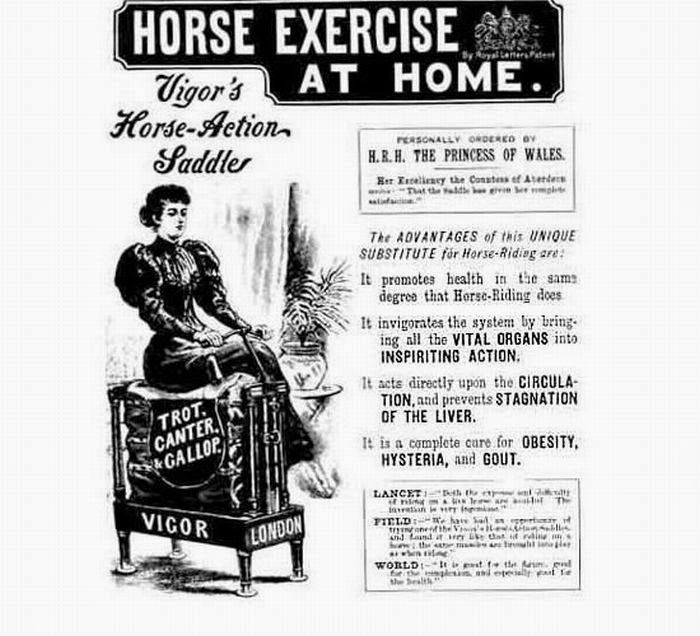 Evidently there's a long history of horse riding simulators as exercise devices. ranging from a trot to a running gallop. Some of the benefits of horseback riding as a form of exercise can be obtained indoors with the aid of an electro-mechanical horse which not only provides fun for the children but sport for grown-ups as well. 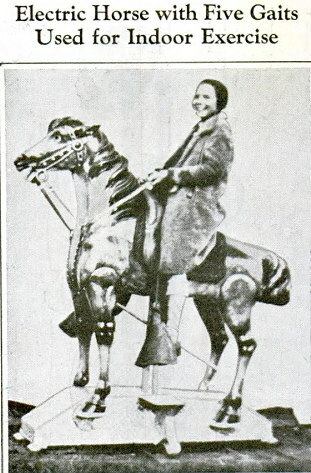 At a touch on the reins, the horse can be induced to break into any one of five gaits ranging from a trot to a gallop. Update: another old time indoor horse exercise machine. 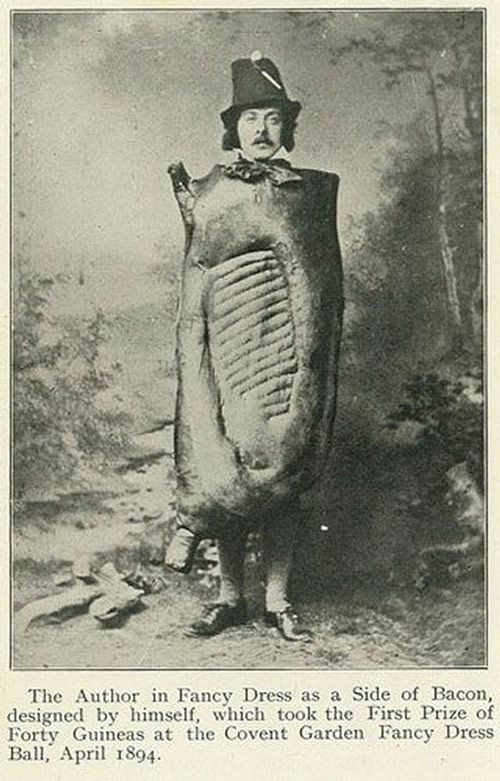 George J. Nicholls, author of the 1917 book Bacon and Hams, dressed as a slab of bacon. More info about this rare and curious book at CookingIssues.com and Wikipedia. An odd example of a movie cross promotion from 1949. 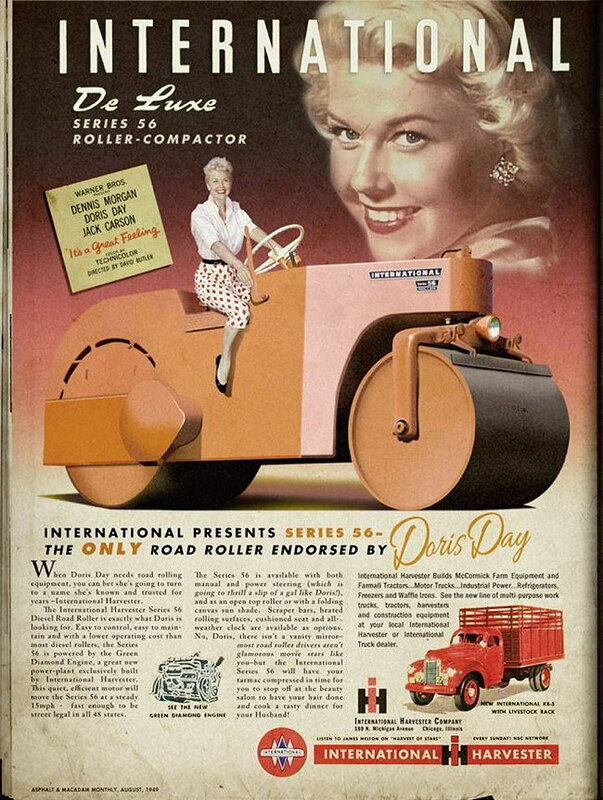 Perhaps fans of Doris Day would also be interested in her favorite road roller! I'm not entirely sure if this ad belongs here or on the Museum of Hoaxes, because there's some odd things about it. For a start, what is this magazine Asphalt & Macadam Monthly that the ad supposedly appeared in? This ad is the one and only reference to such a magazine that I can find. And did International Harvester ever produce a De Luxe Series 56 roller-compactor? 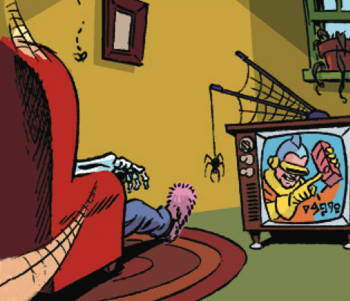 Again, this ad is the only reference to it I can find. 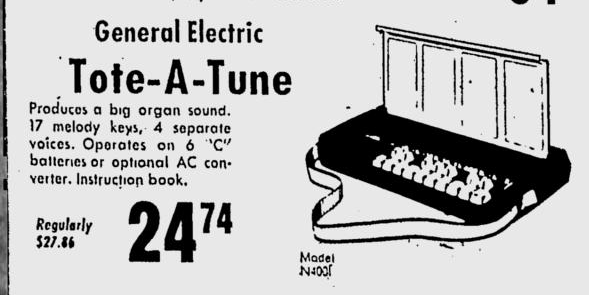 However, print copies of the ad appear to be for sale, which would be odd if it was a fake ad someone had photoshopped together. But it's possible it was a fake ad produced in 1949. The movie the ad mentions, It's a Great Feeling, was (according to Wikipedia) a "spoof of what goes on behind the scenes in Hollywood movie making." So maybe a ridiculous/fake cross-promotion was part of the marketing for the movie? I ran across these intriguing images in an old copy of Newsweek - March 28, 1960. Unfortunately there wasn't much explanation about them. 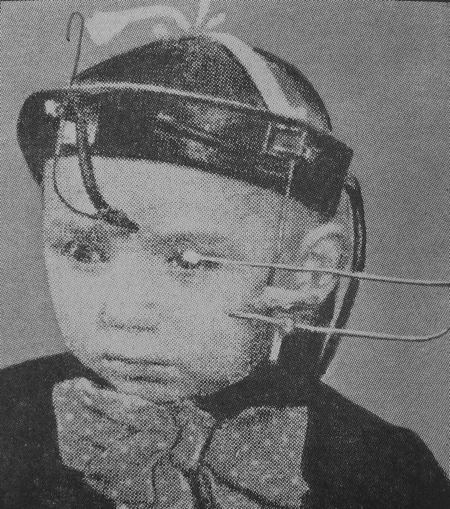 The caption read: "Psychological sputnik: Year-old Soviet child rigged for conditioning experiment." [Luria] maintained that there was little battle fatigue among Russian soldiers in World War II because they had a "purpose." As for the civilian population today: "We have much less neurosis than you have. Every man in our country has an important goal, the 'we'." 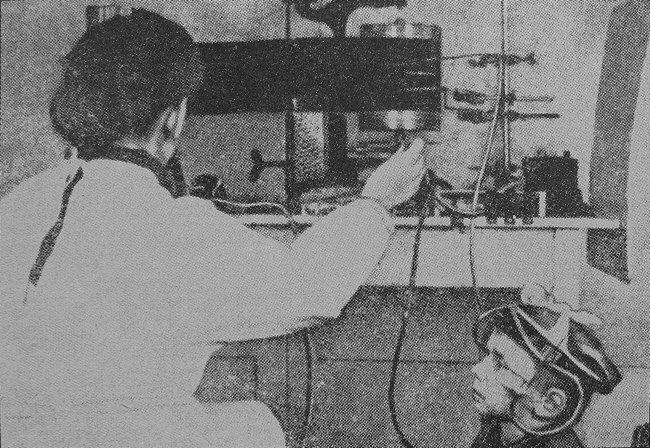 Luria's own goal and the goal of Soviet psychopedagogy, is important, too: Increasing the learning ability of Soviet children by 25 per cent. "Think of it," he said, "such a finding would be worth billions of dollars. It is no less important than a sputnik." So the images must be showing some kind of weird Soviet experiment to boost a child's IQ. The kid would be too young to be Putin. Though there is a slight resemblance.